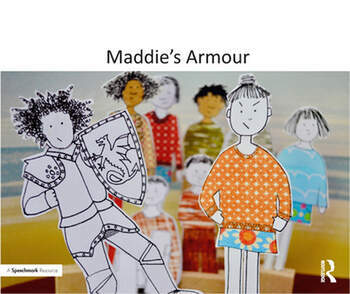 Therapeutic Story StartUps is a creative resource that can be used by therapists and other professionals working with children aged 4-12 years. They are designed to support children to understand, explore and express their feelings through story imagination and play. Six beautifully illustrated storybooks address themes of: Loss, Bullying, Anger, Worries, Family Break-Up and low Self-Esteem. The accompanying characters, props and scenes invite the child to act out their own story, asking the question, "What happens next?... " Six illustrated storybooks, each prompting the child to create their own ending. 30 colourful free-standing characters, six background scenes and a number of additional props. Six mood-cards designed to support story-making. Therapeutic Story-Souvenirs to remind the child of the story they have created. Online guidelines for therapists provide prompts for using the stories and suggestions on how to use the resources. Separate guidelines for non-therapists are also provided. Angela Amos is a Creative Arts Child Therapist currently working as a freelance consultant and therapist in a variety of primary schools in Cambridgeshire. She also works as a clinical supervisor to other therapists. She has written a children’s book: Can I Tell You About Multiple Sclerosis? Published in 2017. Her previous experience includes working as a consultant team leader, managing a school counselling service and setting up a family advisory service offering emotional and practical support to families and children with disabilities. Prior to this she worked as a registered nurse for adults and children with special needs. Anne Cunningham is the Head of Art at a well-known 11-18 independent school in Cambridge. Her role includes teaching art across the school and delivering emotional well-being strategies to younger pupils. Prior to this she set up and ran her own textile design company over a twenty year period, successfully selling printed textiles worldwide to leading companies in the children’s wear market. Her designs featured both characters and repeating patterns with an emphasis on attractive colour combinations. In addition to this she developed her own range of greetings cards also using this distinctive and engaging approach. Aileen Webber is a Gestalt and Integrative Arts Psychotherapist and supervisor working in private practice with children and adults. She has written a book called Breakthrough Moments in Arts-Based Psychotherapy which was published in 2017. She has co-written a chapter in a book edited by Anna Chester and Sissy Lykou called Trauma in the Creative and Embodied Arts: When Words are not Enough (due for publication by Routledge early in 2019). Her previous experience includes working as a special needs teacher, adviser and inspector. She developed and managed an enhanced resource for children with physical disabilities at a mainstream secondary school working with a team of multi-disciplinary professionals, to provide emotional and behavioural support for pupils throughout the school. At this time she produced a series of four resource books to support children with physical disabilities in schools.